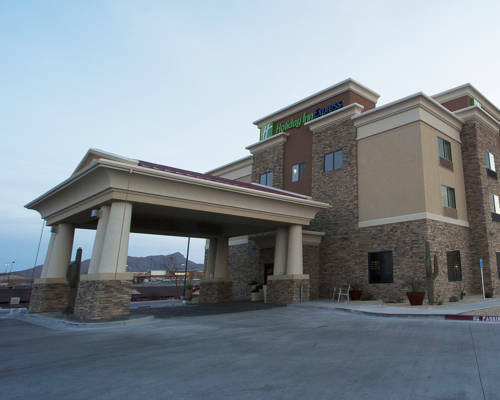 Stay and relax at the Holiday Inn Express and Suites in Truth or Consequences, NM where the scenery is breathtaking.Our beautiful 100% non-smoking hotel is conveniently located off I-25 exit 79B and is minutes from Elephant Butte Lake State Park, Caballo Lake State Park, and Spaceport America. There are plenty of recreational activities that you can enjoy while visiting our area such as: golf, hunting, fishing and our guest favorite - the Riverbend Hot Springs.Travelers will appreciate our convenient location between Las Cruces and Albuquerque. Corporate travelers will appreciate our free HSIA, Business Center and our spacious meeting room for up to 30 people.Our hotel features comfortable rooms with free HSIA, HDTV with premium channel selections including HBO and ESPN, an indoor heated pool, hot tub, Fitness Center, and ample parking for boat enthusiasts.With choices guaranteed to fit every taste, our Free Express Start Breakfast Bar is the perfect way to start your day off right, no matter what you crave. Now featuring your favorite brands and well-loved classics, there's more to look forward to every morning. Locally owned and operated family restaurant. Serves Sandwiches as well as Mexican dishes. Recognized by Golf Digest as one of New Mexicos Ten Best Golf Courses, Sierra del Rio is an 18-hole championship course offering satisfying, challenging play for golfers at all skill levels. Acre after acre of big, oddly-shaped rocks, including "Toilet Rock" and others too awkward to mention. ~57 miles from Truth or Consequences. The exact spot where the world's first nuclear bomb exploded. Open to the public only two days each year. Walk a quarter-mile to ground zero, and take a shuttle to the house where the bomb was assembled. ~58 miles from Truth or Consequences.